additions for Rotating Machine Line. ALT-T174, ALT-T175, ALT-3800, ALT-3850, STR-7044, and STR-7045. ALT-T171A: 24V, 140A, USED ON VOLKSWAGEN VOLKBUS MODELS. ALT-T171B: 24V, 140A, USED ON MERCEDES BENZ TRUCK MODELS. 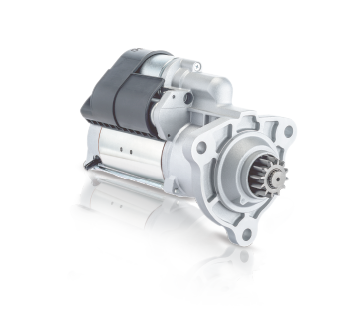 ALT-T172A: 24V, 140A, USED ON MERCEDES BENZ TRUCK MODELS. ALT-T173: 24V, 140A, USED ON MERCEDES BENZ TRUCK MODELS. ALT-T174: 24V, 140A, USED ON MERCEDES BENZ TRUCK MODELS. ALT-T175: 24V, 140A, USED ON DENNIS AND VOLKSWAGEN BUS MODELS. ALT-3800: 24V, 70A, USED ON MACK AND VOLVO TRUCK MODELS. ALT-3850: 24V, 110A, USED ON SCANIA AND HEAVY DUTY MODELS. 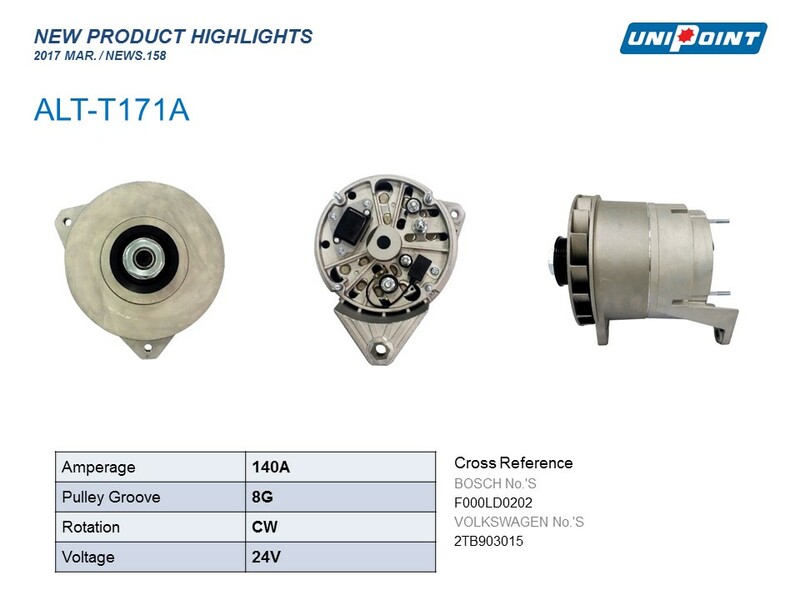 STR-7044: 12V, 0.9KW, USED ON HYUNDAI ACCENT, I30, AND KIA RIO MODELS. STR-7045: 12V, 1.0KW, USED ON MAZDA 3, AND 6 MODELS. You can find the detailed spec, cross reference numbers & applications from our Unipoint News #158. All these products are now ready for production and can be included in your new order.